27 Mar 2019 – On 29 March 2019, the United Nations Security Council will hold a discussion largely devoted to the disintegration of the State of Mali, brought into sharp focus by the brutal killing on 23 March of some 135 persons in the village of Ogossagou, mostly women and children. In addition some 50 persons were badly wounded so the death toll may grow in the near future. 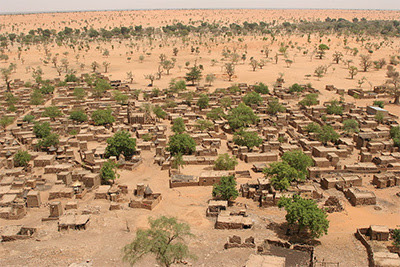 The village of Ogossagou in the middle area of Mali was largely inhabited by Peuls, a cattle-raising group. Thus many men were away from the village, and it was women and children who were killed, often by being burned alive. The attackers are widely thought to be members of the Dogon militia group Dan Na Ambassagou, but uniforms, such as they wear, are easily available on local markets. Thus others could have dressed in uniforms with Ambassagou badges or patches. This is also a real possibility as the village of Ogossagou is close to the frontier with Burkina Faso where there are also armed militias, not directly related to those in Mali. The importance of the U.N. Security Council meeting is highlighted by the fact that the session will be chaired by Jean-Yves Le Drian, French Foreign Minister who had long held the post of Minister of Defense in the precedent administration. The 29 March meeting in New York merits close attention because Mali is not the only example of armed conflicts between pastoralists and settled agriculturalists. We find the same causes of armed conflict in the Darfur conflicts in Sudan and, not directly related, in the conflicts in what is now South Sudan. These conflicts are likely to spread to wider areas of Africa due to the pressures of climate change and the inability of traditional forms of dispute settlement between agriculturalists and pastoralists to deal with the greater scale of the current situation. In some ways this is a test for “early warning”. It will be important to see what type of structures the U.N. can put into place to deal with a growing issue. 1) On the Dogon, it was Marcel Griaule who was the leader, his key books being Dieu d’eau, and the later Le Renard Pale. The writing of his co-workers Genevieve Dieterlen and Michel Leiris are also important. This article originally appeared on Transcend Media Service (TMS) on 1 Apr 2019. Anticopyright: Editorials and articles originated on TMS may be freely reprinted, disseminated, translated and used as background material, provided an acknowledgement and link to the source, TMS: Dogon-Peul Conflict in Mali Draws U.N. Attention to Broader Settled Agriculturalist-Pastoralists Tensions in Africa, is included. Thank you.